According to estimates, calculated by Bloomberg, the top ten cryptocurrency exchanges are bringing in as much as $3 million per day in profit. Considering that cryptocurrency did not even exist until 2009, profit at that level is absolutely astonishing compared to the historical development of other industries. It is easy enough to understand how cryptocurrency exchanges make their money--by charging fees for users who sell, buy, and withdraw cryptocurrencies. 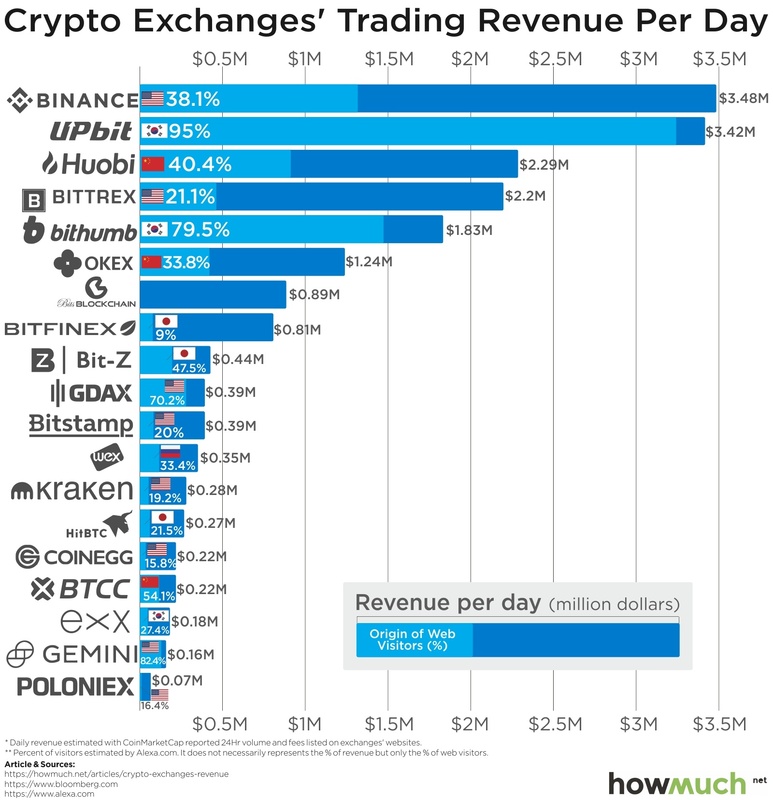 However, there are a few different important stats and trends that can help us to understand why certain exchanges are currently more profitable than others. Asian-based cryptocurrency exchange platforms are dominating the global crypto trading industry. Estimates put both Tokyo-based Binance and Hong Kong-based OKEx at over $1.7 billion traded daily. In terms of volume, these are followed by Huobi (Singapore), Bitfinex (Hong Kong), Upbit (South Korea), and Bithumb (South Korea). It is estimated that over 50% of the world’s daily crypto trading is done on Asia-based exchanges. However, a recently announced crackdown by the Securities and Futures Commission in Hong Kong could signal the beginning of a shift away from Asia if investors and exchange founders become more wary of the viability of exchanges headquartered there. Hong Kong isn’t the only place becoming less hospitable to crypto exchanges. Increased scrutiny in Japan, China, and elsewhere led Binance to recently announce that it will expand its operations to Malta, where the company will offer a fiat exchange option. This is a strategy which will not only help Binance comply with regulations, but could also increase the geographic scope of Binance’s user base. Low costs of cryptocurrency mining: energy costs have made many nations in Asia hubs for miners, fueling growth since the early days of crypto. A well-established economy based on mobile payments: WeChat, AliPay, and other mobile apps are used for both P2P (peer-to-peer) and C2B (consumer-to-business) payments on a daily basis. Gaming Culture: young people are familiar with using tokens in video games as rewards which hold value. Gaming has helped to instill the concept of tokenization and trading of tokens from an early age. For many, cryptocurrency can be seen as the next step in the evolution of tokens. While this answer has yet to be determined, there is undeniably more competition entering the crypto exchange platform market. For instance, Robinhood (US) hopes to become the top exchange platform by offering zero fees on crypto-to-crypto trading. Binance and the other top platforms have yet to lower fees to compete. Nonetheless, many exchanges are finding innovative ways to quickly adapt to the market’s changing landscape. Here are a few examples of what Binance and some other popular exchanges are doing to stay relevant. Decentralization: It is expected that most (if not all) cryptocurrency exchanges will soon become 100% decentralized. This is seen as a way to transfer monetary authority from exchanges to their users. It is also seen as a more secure option. Fiat-to-crypto: Binance, KuCoin, and many other exchanges do not currently offer fiat-to-crypto exchanges due to the time it takes to establish relationships with traditional banks. Now, however, many crypto-only exchanges are looking to spend the time required to build these relationships and overcome regulatory hurdles. Incentivising investments: On many exchange platforms, there are prize drawings for participants buying newly launched tokens. It’s very common for Binance to give away luxury cars, like it did during this Maserati + Mercedes-Benz Giveaway, or to award large sums of bonus tokens. While it’s certainly far too early to tell how much price volatility will affect crypto trading volumes and revenues for the top exchanges in 2018, the fundraising success of ICOs so far this year could serve as a positive indicator of the continued profitability. The combination of innovative user acquisition strategies and overall increases in the number of listed cryptos will likely help many of the top exchanges remain competitive and profitable.